It’s Friday!! I know for most people, that’s a great thing – the weekend is here! Stitch Play, for upcoming articles. And even a wee bit of design work in the sketchbook. What about YOU? What have you been up to, needlework-wise? Anything exciting? Feel free to share your adventures with the rest of us – and if you have a blog or an online photo account (Flickr or whatnot) and want to post a link to your latest needlework projects, feel free! Just leave a comment below! I played with your Hungarian chain stitch last night, and I LOVE IT!! I’ve recently realized that when I don’t get enough time for stitching, I compensate by spending money on needlework. I’ve spent a lot of money recently. So, I’m making a deliberate effort to stitch more in the evening. Last night, I stitched for two hours and finished the second of four flowers in my latest needlepoint project, Lazy Daisy from Pocket Full of Stitches. I’m also working on a counted cross stitch version of Starry Night for my brother and a CCS project on perforated paper, a box from Whiskey Creek, Ink. Mary, these look wonderful. I can’t wait to see more. You “teaser” photos are very effective! 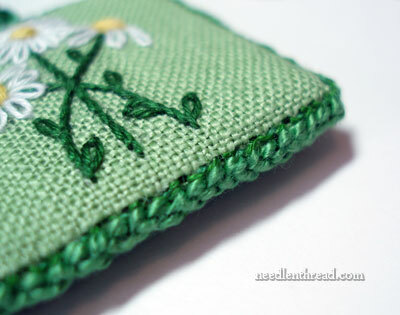 The daisy (sachet? needlebook?) in the first picture looks lovely on that green fabric. I look forward to getting a closer look at that and the little sheep getting blocked. I’m have several projects in progress that I plan to complete before I head to RSN in San Francisco this fall. I try to stitch 4-6 hours a day. I have my tresles set up on the back porch, so I can stitch outside before it becomes too hot. All work on congress cloth is done inside to prevent unexpected “spots” caused by “glowing” from the heat. Mary, you are an amazing inspiration!! I want to stitch just like you—-that is my goal 🙂 I am trying to learn how to do my own finishing on smalls. I noticed your pretty little green daisy piece with the stitched edges. Would you show us sometime how to do that and maybe incorporate other finishes into some of your newsletters? Hi, Molly – yes, that will be released a little later in August! Absolutely! Linen is the best fabric to work on! The little green piece at the beginning of your post intrigues me. The edgework is lovely. 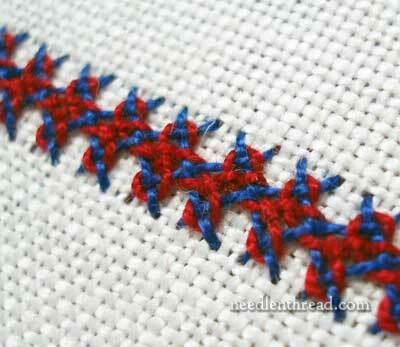 What stitches have you used there? Is it going to be part of a future tutorial? We have chatted on emails before. I used to live in KCK but moved to Oregon. I just wanted you to know how much I enjoy your posts. I have had zero time to do any embroidery recently so I love seeing what you are doing. You are so talented and the fact that you help keep this art alive just ROCKS!!!!!!! 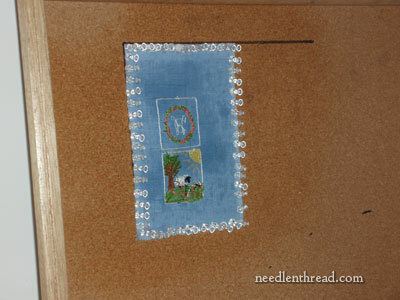 In doing so, I see your little finished piece that is pinned to the cork board and thought this was a great way to block one’s needlework but I’ve not seen it before. Could this be a topic for a newsletter perhaps – How to block your finished pieces? Off to get my new venture, selling children’s books, up and running. Please visit me @ GrandmasBookstore.com. Hi, I’m taking part in the TAST 2012 Challenge ! I read your mail every day and find it very helpful ! Especially your videos ‘How to’! I have many completed projects shown on my blog. Thank you so much for all the help you provide on your website !!! You can see my work here…….. I love your work – all the delicious beading and dyed fabrics. Where do you get your hand dyed fabric or do you dye it yourself? Spent time working on my Martina Weber Chatelaine “Rose Lights” project. I chose Picture This Plus 32ct. Linen in a hand dyed color called “Brash”. My husband says this background color (bronzy) is awesome with this design. Yeah for my honey! I also received my order of silk ribbons from Ribbonsmyth. This is the first time I have seen their ribbons – they are luxurious and the colors are stunning. Starting to think about what I will create with them. Maybe I’ll use some 40ct. Edinburgh hand dyed linen or maybe a Dupioni silk or maybe a cotton sateen as the base fabric for these. So big a stash – So many possibilities – So little time – Oh my! Mary, you always come up with interesting stitches. I am facinated by the edging on the little green piece. Would you share that with us? Have a great long weekend. I have transferred some patterns onto handkerchief fabric. I am planning on doing some embroidery this week-end. I am making things to frame for my house and one for my MIL for either her Birthday or Christmas. Just wanted some advice. What type fabric should a beginner use to start a small project? What do you use for your demos? Hi, Regina. You may have already gotten an answer to this question, but I used cotton muslin when I first started and still do. It’s easy to work with, and inexpensive. It’s great for experimenting with new stitches as well as finished work. I am currently getting ready to finish two pieces which I completed the stitching on. My aunt is ordering the acid free board and the mat for the frame. I am also working on a cross stitch piece called Lacey Pinks br Debbie Draper. So basically I am working on three projects lol. I am not looking forward to the finishing work but I know it needs to be done or else I’m going to end up with a pile of completely stitched but unfinished pieces, which is what is already starting to happen. One of the completed pieces is a name plate for my son. The other one is completely designed by me for my husband. It is a replica of a hammerhead shark tattoo he has on his leg. Those both need to be finished and laced and matted and framed. Unfortunately, I’ve done nothing! I’ve had surgery number 2 in one month, left shoulder, right knee, so nothing is getting done but eating icecream and staring at piled up projects! Soon though…But thank you for giving me great ideas for when I CAN get back to projects! 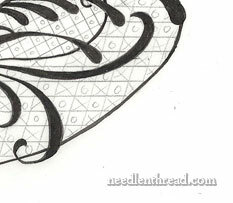 I’ve been working on a crewel embroidery piece this year.I love watching your stitch videos. Sometimes I use a stitch in its ‘proper’ way but usually I play with the stitches and make up what I want for the spot I’m in. You are my go-to site for how-to stitch info! Always looking for time to view your site. Got it today. Fell out of bed last night and pulled a muscle. Can’t walk much so now I get to do what I want to do this weekend-Embroider and learn new things on your site. Love the videos. Love the projects, etc. We all love you too. I have spent much of the week watching the Olympics on TV so thought it appropriate to start the Heritage Craft cross stitch of London 2012 but so far have only done part of 2 athletes. I am also doing Venice from Cross stitch Collection. Am also trying to finish knitting a child’s cardigan. Love your site and newsletter. What is the finishing edge stitch on the little green stitched article above? Can you demonstrate how to stitch it? Just wanted to tell you Mary you are amazing! I am so enjoying watching the videos. And love all the ones that pertain to Brazillian embroidery especially! It is hard to find any Brazilian stitch videos on the net. You can see some of what I’ve been working on if you visit my blog (magpiesmumblings.blogspot.com. I do have a flickr account but no idea about how to link to it (I know – computer literacy isn’t my ‘thing’)! Looks like you’ve had busy week. I have my 7 & 10 year old nieces for a few days and today we played with aida cloth and plastic canvas. And threading needles many, many times. You are a tease, posting all those gorgeous pics with nary an explanation in sight. Keep ’em guessing. I have done not much, except for tidying up my living room workspace, where I do hand stitching while watching TV in the evening. My studio is next on the list but is very daunting. Many years ago I made a long (knee length) vest with cq front panels, and I noticed that it need some repair – the chenille spider roses are coming apart for instance, so I have been trying to work on that. It isn’t easy when you can’t use a hoop and have to wriggle your hand with the threaded needle up, up, up between the lining and the cq panel ….. Thank you for your mini show -just delightful. I want a camera to upload pictures, both indoor and outdoor use. Not a holiday/family/whatever for everyday use but one can take sharp in focus photos like yours mainly indoors. But on the odd occasion a quilt or needlework in nature. Presumably digital. Would you & your kind readers be able to help me. I have been having a go at making embroidered buttons. A daisy button using Bullion knots back stitch and French knots; a Dorset button with various filled in centres; and a Singleton button. These were all worked on plastic rings but am now going to search the net for slightly larger wooden ones. Does any one know of other embroidered buttons. I was so impressed with the free Icon book that you reviewed that I started right away. I will send you a link to a photograph. How did you do that edge finish on the little embroidery featured today? Can you please explain how the edge was done on the green piece of embroidery. Thank you. I often read your blog, but I rarely comment because my english is so bad. I am workin on a long long project: reprodicing a part of the Bayeux tapestry. I found the printed fabric in a flea market (a sort of garage sale), but I had no instructions, no threads, and no idea of how to make the special stitch used for this tapestry. So I began a study work to find all the informations necessary to stitch my linen fabric. One of the difficulties I am dealing with is that the design on the fabric have sometimes huge errors, and i attempt to correct it, recontructing the good design. I is a very slow work, but very exiting and full of interessant experiences. you can find all the messages about it in the heading “Tapisserie de Bayeux” (at the end of the right column on my blog). What is the stitch around the green embroidery. I am looking for s nice edging stitch but cant figure out what this is. Love your page. Mary, I really enjoy your blog and have learned a lot from it. I did nothing but cross stitch for years but have been doing a lot of embroidery the past year and loving it! 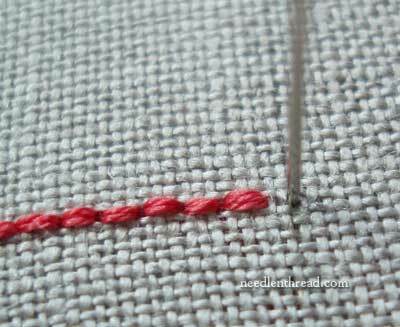 I have tried the braided chain stitch and it turned out beautifully. Right now I’ve started embroidering some kitchen towels for the Thanksgiving sale in November. I just saw the woven picot and think it is amazing. I am impatient to give it a try. Thanks for all the stitch play that you have been sharing. I feel more educated on needlework now and shall enjoy continuing to learn. 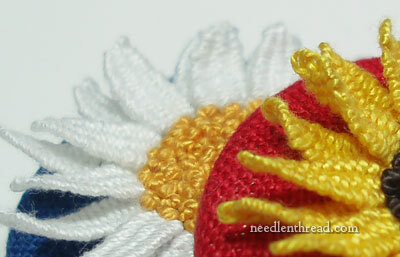 Previous Previous post: More Video Updates on Needle ‘n Thread!